The Album is called "the Rebel Lion". This is Jeremiah Dirt's 4th solo release and is already being met with rave reviews. "the Rebel Lion" is a themed album where Dirt celebrates his childhood love for Reggae & Jamaican culture. As a youth, Jeremiah found himself homeless at times. He recieved home, food, shelter & protection with a San Diegan community of of Jamaican-born Rastafarians whom shared their hearts and culture with him. Though Jeremiah never adhered to the Rasta Theology, he never forgot the people that took him in and encouraged him. It was his experiences in these early teen years of his life, being lost and hurt and ministered to, where he truly developed a passion & heart for ministry to the lost and hurting. The idea behind the Title "the Rebel Lion" comes from 1 Peter 5:8 where satan is referred to as a 'Roaring Lion' - as well as all the references to the Messiah being called 'the (Conquering) Lion of the Tribe of Judah' (Revelation 5:5). In this world of corrupt disobedience to God, the 'roaring lion' is devouring masses of people with all kinds of devilish deceptions. Jesus Christ is the contradiction to all of that. He is the CONQUERING Lion that brings God's people BACK to God. So in a world where everyone is rebelling against God, Jesus sparked a revolution rebellion BACK to God through His own passion on the Cross. 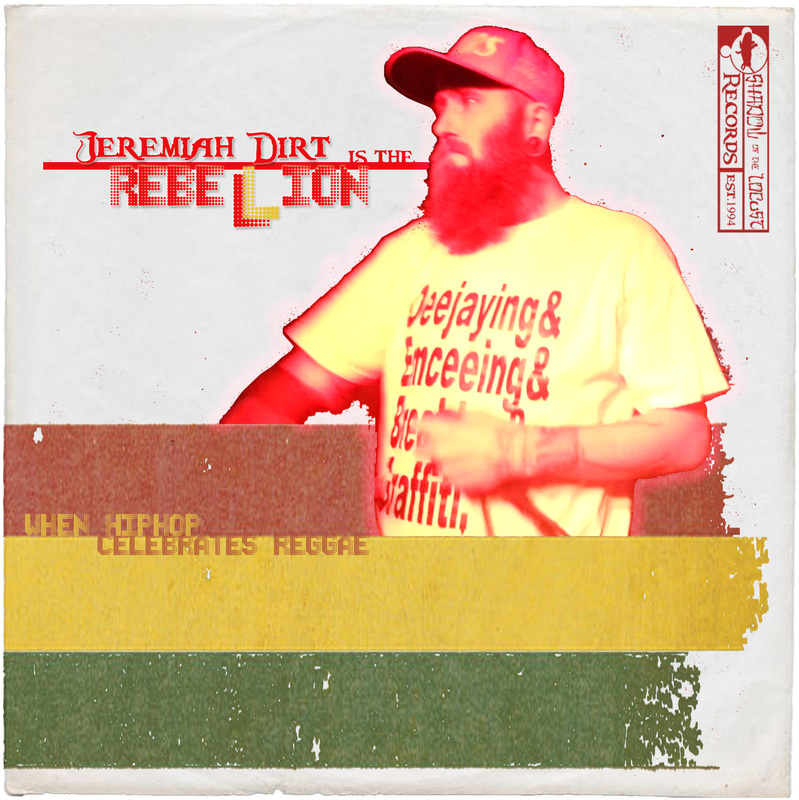 When Dirt says he is the "Rebel Lion"... he is actually pointing to and glorifying Jesus, as the 'Rebel Lion' in his heart. Dirt is expressing that he represents the 'Righteous REBEL-LION' of Christ BACK to God. 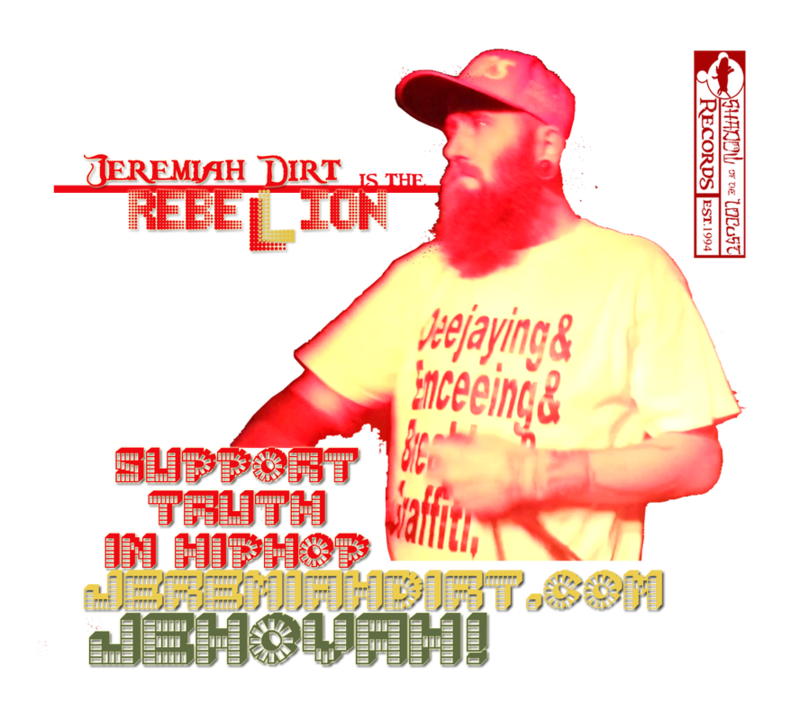 Jeremiah Dirt is 'the Rebel Lion' as much as ANY believer in the Gospel is and we of the faith are all leading Righteous Rebellions BACK toward God in our Lives! Obviousy it is Jeremiah's goal to Tour the New album! You have been given the Link to this Page to get a glimpse of Jeremiah's Vision for doing such. Performing Shows is only half of this Musician's Heart. Dirt believes in the Music that God puts on his pen to create catalyst for positive change in people's hearts/minds (Read the Lyrics under the songs to the right). The vision is to put on a dynamic show for your venue/event AND leave your audience inspired with creative presence AND product. Not JUST to perform the music BUT also PRESENT the Music as a Gift! These selected tracks from the album showcase the deep, impacting Testimonial lyrics of Jeremiah Dirt. These are the songs, with all their relevant emotion, that Dirt hopes to convey at his live shows. For $300 Jeremiah Dirt can play your venue/event/group. ---$200 of that price will be to cover all costs for the artist to come out (travel, time off work, etc). ---$100 of that price will be to cover the cost of 50+(J. Dirt will squeeze it as MUCH as possible to get as many, CDR, Packaged/Sealed w/ Promotional Cover/Sleeve) Promotional copies of "the Rebel Lion" SPECIFICALLY TO GIVE OUT TO YOUR AUDIENCE/GROUP. ​-Dirt gets to do what He was made to do... Bless People through music! To Clarify, it is Jeremiah Dirt's passion and vision to Perform AND Present his music at your event. To leave an impression at AND after the Show. Few artists today would take a portion of their earnings to specifically spend right back on to the shows they are performing. ​TOGETHER, Let's put on a Good Show! Email Dirt to Schedule an Event!